Will it work with my trainer? What about my power meter/cadence/speed/heart rate monitor? Zwift for iOS only works with bluetooth signals, no ANT+. Fortunately, today many smart trainers, power meters, and other sensors broadcast on both ANT+ and Bluetooth. Can I use my iDevice to play Zwift on my big screen TV? Yes! You’ll need an adaptor to do so–Apple’s Apple Lightning Adapter does the trick. It even includes a second place to plug your charging cord so your iDevice can charge while Zwifting on your big screen. Some Zwifters are using Airplay to send Zwift from their iDevice through AppleTV to their TV, but I have heard reports of poor framerates using this method. One user told me this problem is AppleTV version specific, with 3rd generation not doing very well but 4th generation handling Zwift quite nicely. Very smooth and sharp on the actual iDevice. If you run your device into a big-screen TV you will lose some sharpness, but the overall quality is still quite acceptable, on-par with a mid to upper-range desktop computer running Zwift. Generally, going from a iPhone to a TV will give you a worse picture than going from an iPad to a TV, since the iPhone runs at a lower resolution. But both maintain high frame rates and decent picture quality even on a large screen. 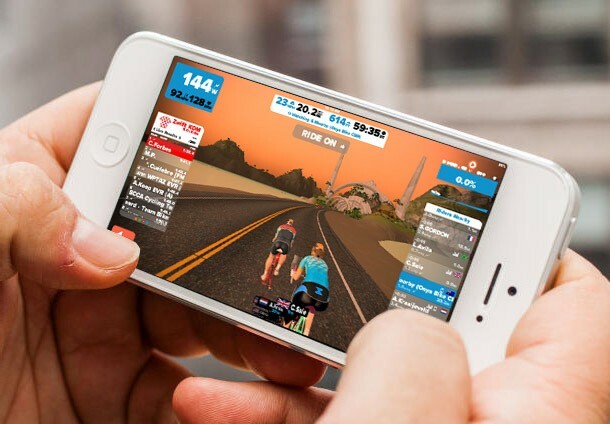 iPhones display at 16:9 aspect ratio, so Zwift on an iPhone will fill the entire screen of a typical big-screen TV. iPads display at 4:3, which means you will have unused space on either side of your picture. Is my iDevice able to run Zwift? 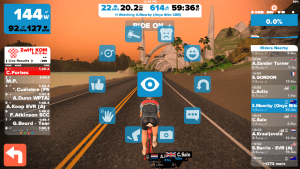 Zwift for iOS requires iOS 9.0 or later. Compatible with iPhone 5s, iPhone 6, iPhone 6 Plus, iPhone 6s, iPhone 6s Plus, iPhone SE, iPhone 7, iPhone 7 Plus, iPad Air, iPad Air 2, iPad mini 2, iPad mini 3, iPad mini 4, all iPad Pro models, iPad (5th generation), and iPod touch (6th generation). How much battery will it use? Zwift needs a lot of power to run smoothly, so you should plug your iDevice into a charger while Zwifting. If you are unable to do that, try to start your Zwift session with a fully-charged battery and don’t plan to ride for more than 45-60 minutes. How do I enter promo codes to unlock new kits? Zwift has a lot of jerseys you can unlock, but there is no way to do it in the iOS app due to restrictions by Apple on in-game promo codes. For now, you will need to open your Zwift account in the desktop (PC/Mac) version, get into the game then hit “P” on the keyboard to enter your unlock codes. A full list of available kits can be found here. Two-finger touch brings up a full list of gestures. You can swipe with one finger to remove the left-hand leaderboard or right-hand rider list. Tapping once on the screen will bring up a list of options you can click to give a ride on, send a group message, flip a u-turn, etc (swipe right or left to scroll through the options). Tapping with two fingers brings up that entire list so you can easily select one. How do I copy my custom workouts to my iDevice so I can use them there? It’s pretty easy, actually! See this post for details. How do I find my Zwift ID (for ZwiftPower usage)? Trying to get set up on ZwiftPower.com using only your iOS device? You’ve just got to get a little creative–here’s how to do it. Does Zwift for iOS support my Bkool trainer? I'm getting no sound when using AppleTV to mirror from my iDevice to big screen. What am I doing wrong? Am I able to use the PowerTap PowerCal heartrate monitor to send power to Zwift so that I can now use that strap + my IOS device to Zwift from any gym, anywhere? Regarding battery use its not that bad. I did a 2 hour ride with 4 BT devices connected to iPad Air and battery only drained from 90% to 30%. Totally usable while not plugged to power. Yes. I have used my BT PowerCal with the iOS app a few times while using a spin bike .. works fine .. just don’t expect it to be very accurate. How do you go to the customize page and change bike etc ? Thanks Eric, excellent post. I’ve had crisp, clear performance with AirPlay mirroring to a 4G AppleTV from an iPhone 6S, but ts a bummer that the app is not configured to transmit audio when mirroring. Hopefully they will address that in a future update. make sure your ringer is turned on. I had no sound on either my phone or tv while in airplay… until I turned on my ringer. “P” and entering the code. it unlocked and worked fine on my PC as I was paused because I don’t ride with my pc, but it doesn’t change my kit when logged in to my account via iOS . It’s not in my customize option. My guess is you have closed and reopened the Zwift app on iOS. This will load up yournunlocked jerseys I bet? Give it a try and report back please! I’m having real trouble connecting my Zwift account on my iPhone. It runs fine on my Mac but I can’t connect to my cadence/speed sensor on the phone. Is there a trick to this or am I missing something? The programme just sits on the searching page and can’t find the sensors. Blue tooth is on. Im using garmin speed/cadence sensors. Just discovered your blog and have learned so much since to me the ZWIFT program isn’t the most intuitive. I would like to connect my iPhone 6 to my BKOOL PRO trainer via bluetooth. This trainer does have bluetooth technology. Do I need anything special on my iPhone (other than the ZWIFT mobile app) to connect to it or should I see it under BT devices? Thanks! Is controlling ride from zwift Mobile only for iPhone? I have android and action is the only page not shown. When will full Zwift on Android be available? I can stream my Galaxy S7 screen right to my Samsung TV screen. All I need is the Viiiiva Heart Rate Monitor to convert my ANT+ signals to Bluetooth to my phone. I joined the cat c race 10 minutes prior was all staged up rode the race, had my race ID set in my name EVR C, but I never showed in the results ? Well past the finish line i cooled off from the effort and rode a bit then went to end the ride and it asked me if I wanted to quit the event, that confused me so I rode around a bit more and then had to exit, but I never showed in the results? I do show in the unlinked portion of the Zwiftpower race results on the bottom tab, but I have no clue what unlined eans. I had one successful KISS race so far last week. Except I entered in the b category showed up in the Zwiftpower results as a c rider with the ftp should upgrade warning. Zwift power is confusing with no ey or legend to help out, died that exist anywhere? Just a note: I’m using the Apple Lightning-to-VGA adapter to drive an old PC monitor with an iPhone 5S, and it’s working well. When using airplay to AppleTV from my iPad, I don’t get sound either from my iPad (as expected) or from the TV. Is this a known “bug” and is there a solution for it at this point? I had no audio from my phone or tv initially when in airplay mode… until I turned on my ringer. The audio works just fine from my iPhone SE and 2nd Gen apple tv. Did you link your Zwift account to your Strava account? You have to sign into zwift.com and click the “Connect” link for Strava to do that. Is it possible to give a “ride on” from an ipad? When I touch the screen the full list of options appears, an elbow, a high-five, u-turn, camera etc, but the “ride on” is greyed out. I have the same problem and also don’t understand it! I wanted to use a Promo Code to change my kit. I only use IOS (iPhone 7plus) for my game. My old laptop is old, still using VISTA. I have tried to get online with my zwift account to change it using the “P” on the keyboard when in the game, but I can only get into my account page, not the game to change it. Is there any other way. When I type ZWIFT.COM, i just go into my account when I log in. I have been using a Wahoo Tickr HRM with my Ipad,no issues till this week. On settings on my ipad the HRM is connected but when I turn on Zwift it doesn’t get past the searching screen as it doesn’t find it. I then tried my iphone and had the same issue. I can still record my heart rate on my Garmin Edge. Has something changed recently at Zwift? Hi, I have just connected to Zwift and I am using a classic trainer that is listed on the Zwift site, + Garmin speed/cadence sensor. I connect this through my iphone 6 with an Ant+ adaptor and everything pairs up fine. The problem I have is the speed/power data shown on the Zwift site is double what it should be when using the iPhone (this is not the case when using my Mac mini). Any reason why the iPhone speed/power data is so different to that of the mac? Hi, I have a bin Problem using the app. No prob to log in and take a Ride. So I have to log in again. And there is the prob. The App tells me my password is wrong?!?! Can’t ride again because in the App is no chance to log in again. Please help.. I somehow paused my Zwift app on my ipad. How do I unpause it?